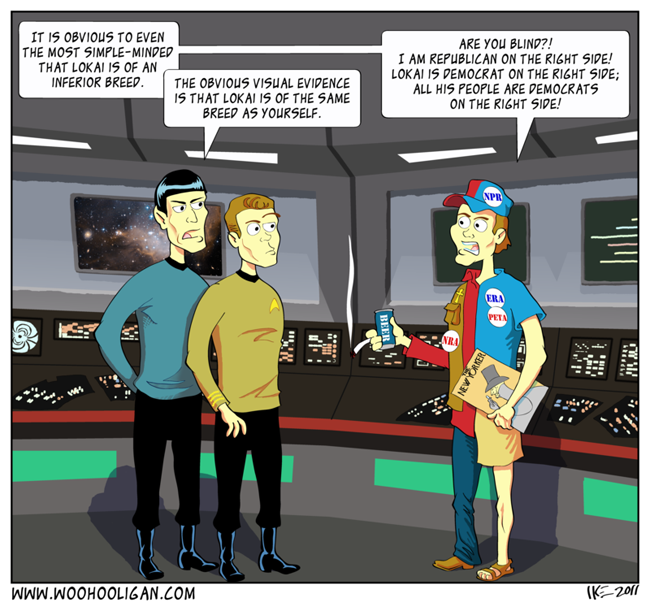 This comic tries to convince us ultimately that "Republican vs. Democrat" is an either-or fallacy. It also tries to convince us that Republicans and Democrats are not as dissimilar as we tend to think they are (not that they can be "half republican" and "half democrat", although there are a great many "centrists" in the US, who could be accurately described as a mixture of both mindsets). I for example believe that people should have the right to own guns. Does that make me a Republican? I also believe that governments can do good things and that we should have a social safety net. Does that make me a Democrat? People are capable of changing their minds in light of new information and of compromise when it's needed and both of these things are good and like StarTrek they embody the best in mankind and allow us to make progress -- but this polarized mindset doesn't allow either of them. In our political landscape, if a person receives new information and it rightly changes their mind about a subject, we criticize them for not standing their ground. It's high time we started asking why a person changed their mind on a subject, investigating their reasons and when deserved praising them for doing the just and often hard work of learning. Two things. First, I promise no more strips about racism for a while. Second, yes I know I'm getting political again... but this couldn't wait. In the aftermath of the Tuscon shooting (don't worry, I won't dwell on it), there's been a lot of discussion about toning down the rhetoric in our public debates here in the US. Wouldn't it be nice if we could discuss actual issues instead of calling each other communists and Nazis and baby-killers? 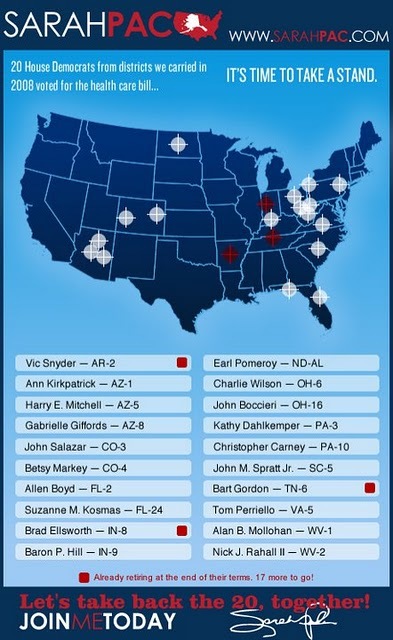 Speaking of killing babies, Sarah Palin apparently received some heat after the shooting regarding a congressional district map she published on her website with symbols resembling cross-hairs over the districts of many democrats, including the district of congresswoman Gabriel Giffords who was shot in the attack. Initially, Palin's response was imo appropriate, saying that the shooter was an a-political crazy person and you can't blame the actions of a lone crazy person on other people... until she then turned around and in the same breath blamed his actions on democrats and liberals by describing him as "left leaning" and went on the offensive calling the discussion to tone down the rhetoric a "blood libel" on the part of liberals and democrats. I'm no scholar on this subject, but I don't see where saying "please tone it down" or even "your actions may have encouraged violence" is the same thing as saying "you're a baby killer!" It seems to me that two things are going on here. First, no Palin is not to blame for the shooter's actions. Second, Palin proved the point of the people who'd like "civil and honest" talk in Washington, because her response was neither civil nor honest. Luckily her blood libel comment seems to have backfired on her, causing the public to see her as undesirably antagonistic. I was thinking about this when I realized that Palin's hypocritical blood libel comment reminded me of an old Star Trek episode titled Let That Be Your Last Battlefield in which the Enterprise is host to two warring aliens with two-toned skin, solid black on one side, solid white on the other side, split right down the middle. When this episode originally aired in '69 it was criticized for being too "heavy handed"... but given how polarized we've become, with amazingly antagonistic people like Palin a hair's breadth away from the 2nd most powerful job in our country, and that she and other Republicans referred to the health-care reform that they themselves mostly wrote with terms like "death panels" (another Palinism), I think this heavy-handedness is truly deserved. You can watch the whole episode on the CBS website. I think Kirk and the Enterprise crew are pretty much where most Americans are today -- looking at the fighting on TV like those aliens and wishing they would both grow up! Palin didn't cause the shooting. I won't blame her for it. I will say that I want to see fewer screaming matches on TV and it would be nice if she would join us in more civility and honesty. I believe we can be better. That person would be more of an oxymoron than the term Military Intelligence. Thanks, Mag! Yeah, it's a really old episode, so I'm not surprised you hadn't caught it. How can people read Internet comics... - ...without having seen all the backing source material? Th col knew exactly what was referred to, having seen the show when it came out.